Q: Is it true that I should cut the roots of plants before I plant them, especially if they’re rootbound? A: Good question. This one gets debated a lot. You know you’ve got a rootbound plant when you tip it out of its container and matted roots are more prevalent than soil. Wrapped in a tight ball, the roots usually circle the bottom of the plant because they’ve had no place else to go and the soil around them has broken down. It is best to separate the roots as best you can before planting, and that probably means cutting out some of the most matted parts. Being rootbound puts a lot of stress on growing plants because they lack the nutrients they need to thrive. If you don’t try to correct the situation at planting time, those plants are likely to be stunted. They may even fail to grow much at all or even die. The debate comes in over whether to slice the roots on the sides of container-grown plants whether they are rootbound or not. 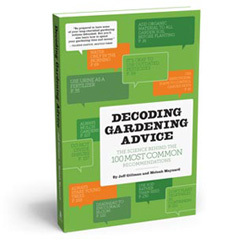 Studies have indicated that the practice doesn’t help but many gardeners think it does. So you might want to try experimenting with that yourself. Q: I bought a balled-and-burlapped tree. Do I need to remove the burlap before planting? Q: My trees are being attacked by woodpeckers. What can I do and why are they suddenly doing this? A: Sometimes, woodpeckers start drilling into trees for no discernable reason. Usually, though, they’re after insects they’ve detected within. So what you want to do now is try to figure out what type of insect has invaded your tree and treat the problem as quickly as possible. I would recommend contacting a tree service for this and, if you do this, be sure to hire a company that uses certified arborists. Trees add a lot of value and beauty to a home and someone who isn’t qualified to care for them may wind up doing more damage than good in the long run. If bugs aren’t the problem, try hanging pie tins, CDs or other shiny objects from the tree the woodpeckers after and they’ll probably move on. FAQ: Landscape fabric, yes or no? Q: I want to keep out as many weeds as possible. Is landscape fabric a good choice? A: Heavens no. Though you see this stuff used by professional landscape companies all the time, landscape fabric (also known as weed barrier cloth) should never be used in an area where you want to plant living things. Not only is it completely hideous (and some of it always winds up showing), it doesn’t allow water to penetrate the soil in the same way it would normally. It also prevents adequate oxygen from getting to plant roots where it’s needed. And just wait till the day you want to move a shrub or plant something new and you have to maneuver around that thick layer of yuck. If you want healthy plants, skip the landscape fabric and use mulch instead. Shredded hardwood is always a good choice, and there are several sites in Minneapolis where you can get it for free. Check out this website for a location near you: www.ci.minneapolis.mn.us/news/20030813mulchsites.asp. Shredded leaves and cocoa bean mulch also work well, particularly around annuals and perennials. It sounds like overkill, but mulch should really be 3- to 5-inches thick if it’s going to help prevent weeds and retain soil moisture. Q: I have several zucchini plants, but they’re not producing fruit and the flowers are just falling off. Why is this happening? A: I get this question a lot. It sounds like you’re suffering from a lack of pollinators. Zucchini plants have both male and female flowers and only the female flowers produce fruit. (Female flowers are attached directly to the main vine rather than by a stem.) While it is not uncommon for some of the male flowers to bloom first and fall off before female blossoms have started to open, if a lot of blooms are falling off without fruiting it’s probably because they aren’t being visited by pollinators. In order to flower, pollen needs to be transferred between male and female flowers by insects. Perhaps cool, wet or windy weather has kept pollinators away this year. If you spray to control insects or plant problems, be aware that herbicides and pesticides can also harm beneficial insects like bees. Whatever the reason, if you lack pollinators, you can hand pollinate plants yourself by using a Q-tip or small paintbrush and swirling it inside a flower and then moving from flower to flower as a bee would, swirling the Q-tip or brush gently each time. FAQ: Safety of rain barrel water? Q: Is it OK to water vegetables with water from my rain barrel? A: People disagree on this, but most say no. The reason for this is that runoff from asphalt shingles, which most roofs are covered with, contain bacteria and other contaminants. Plus, no one seems to know whether plastic rain barrels sitting in the summer heat leach chemicals into the water contained inside. To be safe, don’t use water from rain barrels on anything edible. Save if for your lawn and other plants.